Discussion in 'Chicken Behaviors and Egglaying' started by Granma in Costa Rica, Aug 6, 2009. Does anyone have a recommendation for a battery operated, jungle resistant, inexpensive remote camera that can send a signal to my PC from less than 50 feet? PS. To any kind chicken folk who respond, I must catch the bus back to my jungle. I only get to the internet cafe once or twice a week. I will be back. I tried a wireless camera. 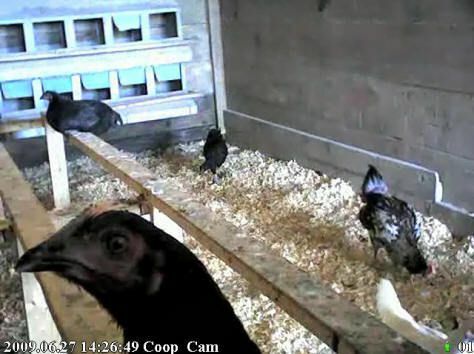 Daytime pictures were ok but really couldn't see anything at night even though I have a low watt light in their coop. 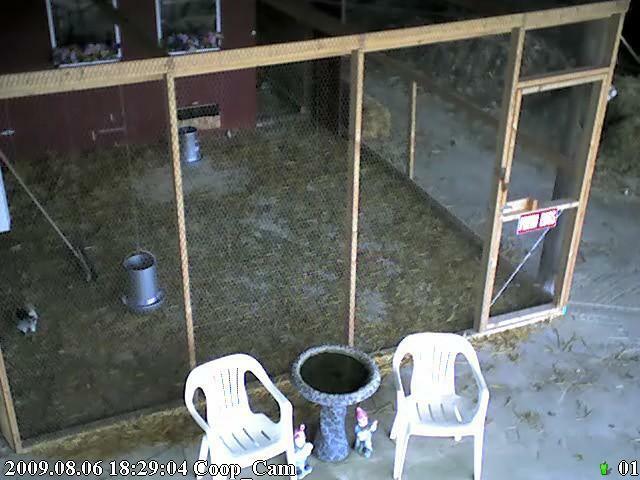 Here is a picture of their coop with the red light I have in it. I use a Dlink DCS-950G wireless camera (with mic) which goes to my wireless router (over 200 ft). Then I pull it up on my pc using windows internet explorer application. Quote:How well does it work at night? Quote:Are you getting good quality images ...I had looked at this model and so many of the customer reviews were poor. The price is about $170 so it is a good price, just wished the reviews were more positive. It has a "night mode" and brightness adjustment built into the camera. I have a 15 watt bulb in the coop (16x16 ft) that is on at night just to have some dim light inside. I can see the girls on the roost faily well.. The picture is a little grainy at night, but during the day is very clear. Without the 15 watt bulb, the camera would not show anything. But that is to be expected.. as you have to have light to see in the dark..
not sure how ya'll upload picts into the thread.. I aint figured that out yet.. I'd upload some snapshots so you can see them as soon as I figure it out.. Try this.. See if the picts show up.. Here is when I had the camera in side facing the roosts and nests.. Picture is during the daytime. I dont have any night snapshots. Here is a snap shot I took at 630pm tonight. I moved the camera outside for a change of scenery last week. Only the roo is outside. Oh, and the bird bath is not for birds.. it's one of many "kitty" watering holes around the farm. Do you use a regular light or red bulb? I bought a wireless camera but even with a light the pictures were really poor so I returned it. Since I have bought a wired multi camera system. I have good night vision with it. I can view on my computer anywhere in the world but it was pretty costly. Here is a picture I just took with it. Right now it is cloudy with the setting sun trying to peek through. I just realized I have the year wrong and it says 2019. I use a white light (15 watt) .. It's just enough so they can see, yet dark enough for them to settle in and sleep all night long.